“This year’s REINZ Awards were recently held in Auckland and Property Brokers featured amongst the best. The Ashburton rural team won ‘Small/Rural Office of the Year’, which is a spectacular achievement. This was followed by Ian Morgan from our Matamata office walking away with ‘Runner Up Rural Salesperson of the Year’ for the whole of New Zealand. A fantastic result for all of his hard work and dedication. As always, it is great to see Property Brokers people standing out in the industry. These accomplishments certainly do not go unnoticed and are testament to the commitment displayed by the entire Property Brokers team. 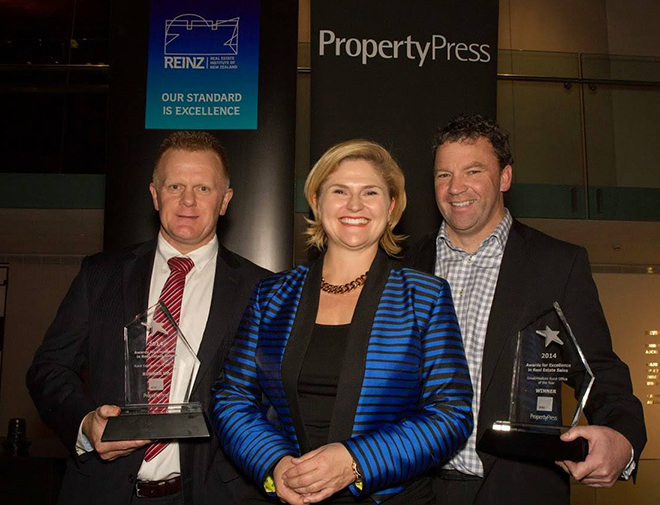 (Paul Roache and Hamish Niles proudly show off Property Brokers awards with REINZ CEO Helen O'Sullivan).